The Ryobi 40V 20-inch Cordless Snow Blower is engineered to remove snow quickly from patios, decks and driveways. With a powerful brushless motor and Load Sensing Technology, this snow blower provides consistent quiet power that efficiently discharges snow up to 25 ft., and it also features a push button start as well as twin LED headlights. For added convenience, the Ryobi Snow Blower is equipped with one 40V 4Ah High Capacity Lithium-ion battery that provides up to 40 minutes of runtime, and a Ryobi 5-Year Limited Warranty. 20-inch 40V Brushless Snow Blower The Ryobi 40V 20-inch Cordless Snow Blower is engineered to remove snow quickly from patios, decks and driveways. With a powerful brushless motor and Load Sensing Technology, this snow blower provides consistent quiet power that efficiently discharges snow up to 25 ft., and it also features a push button start as well as twin LED headlights. For added convenience, the Ryobi Snow Blower is equipped with one 40V 4Ah High Capacity Lithium-ion battery that provides up to 40 minutes of runtime, and a Ryobi 5-Year Limited Warranty. 20-inch 40V Brushless Snow Blower is rated 3.8 out of 5 by 8. Rated 5 out of 5 by Daddyo123 from The best 20in. 40Volt Brushless Cordless Electric Snow Blower Easy to set up for use. Light weight to be able to move anywhere. It is great to have a spot for the extra battery. Very handy for porches and sidewalks. I love this snow blower. Rated 5 out of 5 by JW123 from Works great for decks and walks This snowblower meets my needs to clear snow off my two decks and walkways. I was surprised as to how long the unit ran before the battery stopped working. The first storm left 3 inches of wet snow and the second storm left the same except powdered snow. I cleared two 13 X 14 foot decks, a walkway 40 feet long by 3 feet wide, and the top area of my paved driveway area 24 feet by 40 feet. 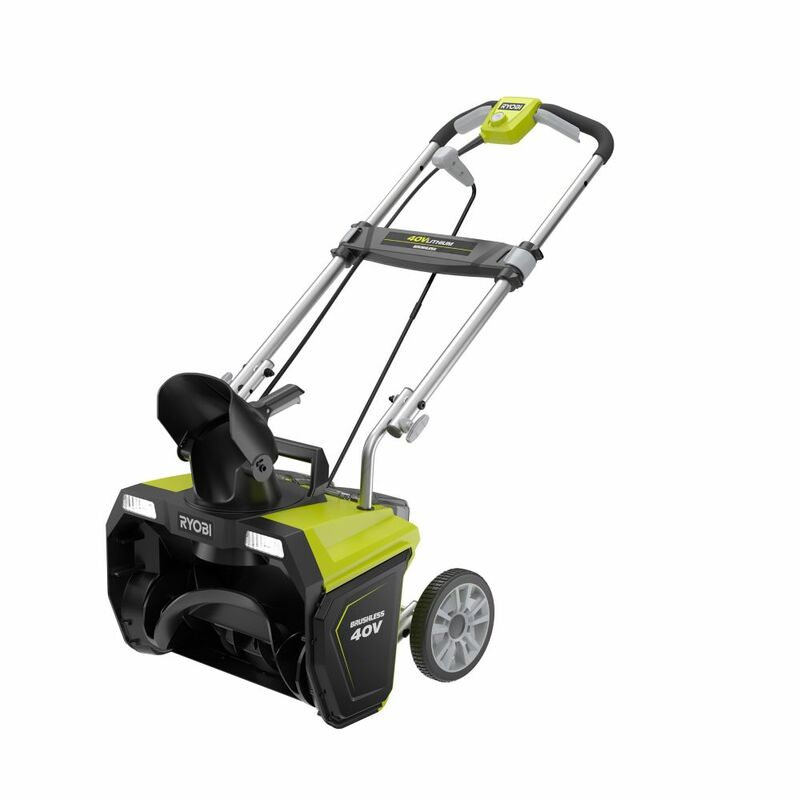 The unit met my criteria: - Battery operation (I have a Ryobi 40V string trimmer) - Light weight to carry up 10 steps - Portable. Can put in my SUV to let my daughter use it - Good enough to clear three to four inches of snow I let my daughter use the unit for her small driveway and front walkway as well as a path for the oilman. It won't clear the base of her driveway from snow plows but it does work well for her as she has rhumatoid arthritis. As the season just started, I am hopeful the unit will become a best buy for me and my family. Rated 5 out of 5 by Lizfox from Everything I wanted! Bought this today. Charged battery. Cleared 60 foot driveway and turnaround of almost a foot of snow in 35 minutes. Lightweight (I'm 70 and that matters!). Headlights a bonus. Was able to put car away in garage and can't wait to clear the snow again!